PMC"s proposed development on 23rd Street would have a 54-foot-high, solid garage wall at the corner of Cherry Street, one block from the Schuylkill River Trail. One of the happy lessons to come out of Philadelphia's long-running building boom is that urbanism sells. Developers — the smart ones, anyway — have increasingly come to recognize that this generation of city dwellers prefers to live and work in buildings with lively ground floors studded with restaurants, retail, and services. Not every project gets the details perfect, but we're seeing fewer towers hiding behind blank walls. But just when you think it's safe to put your Jane Jacobs back on the shelf, along comes a design from a developer who must have skipped the chapter on neighborhood placemaking. The latest proposal from PMC, the Philadelphia apartment giant, would set a pair of skyscrapers atop two massive garages along the Schuylkill waterfront in the Logan Square neighborhood. Though the compound has intermittent openings for retail, most of the perimeter would be sheathed in a screen made from perforated metal panels. In certain places, those unrelenting metal walls would rise five stories above the sidewalk, taller than some nearby rowhouses. In its general outline by PMC, the project has the potential to be transformative for the city and its booming Schuylkill waterfront. The complex would fill in Logan Square's last big surface parking lot, a site that spans two city blocks along 23rd Street, between JFK Boulevard and Cherry Street. That unattractive asphalt expanse has long been a no-man's-land separating Center City and Logan Square, and PMC's elegant towers promise to close the gap by adding 612 apartments to the neighborhood. 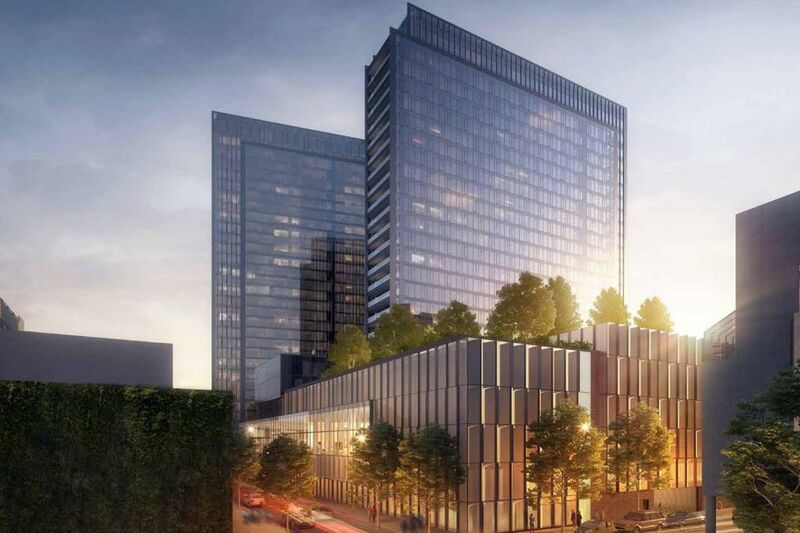 The huge Schuylkill waterfront site proposed for high-rise apartments by PMC would be surrounded by a five-story parking garage. This is the view from Rivers Edge Condominiums, looking south to JFK Boulevard. The key to its success is the corner of 23rd and Cherry. Ideally, that intersection should be PMC's gateway to Logan Square. But instead of greeting the neighborhood with a friendly storefront or an apartment entrance or some other sign of human habitation, PMC's project turns its back with a 54-foot-high wall of steel. As bad as that metal wall will look from the river, the impact on the neighborhood's collection of high-rises and rowhouses would be even worse. City planning officials have reacted to this deeply flawed design with a strange mixture of horror and resignation. At last week's session of the city Design Review board, its members were sharply critical of the garage and instructed PMC to make substantial revisions to deal with its blank walls. But after the meeting, several Planning Department staffers predicted the twin towers on the Schuylkill would end up being built exactly as PMC's architect, Gensler, designed them. If that happens, it will be a major setback for the Planning Department, which has made big strides over the last decade. Besides adopting a new zoning code and a citywide master plan, the Planning Department spun off the Design Review board as a means for raising the bar on urban design. Unfortunately, the review board is merely advisory. It can nudge developers, as it did with PMC, but it cannot compel them to do the right thing. That leaves the Planning Department staff to do battle with developers. Oddly, this project seems to have gotten little attention, despite its size and prominence. Most of the hard negotiations fell on volunteers from the Logan Square Neighborhood Association. Unlike their counterparts on the Delaware waterfront, which has been the focus of a decadelong planning effort, the Logan Square volunteers had no design guidelines to support their effort. There is no master plan for new construction on Center City's portion of the Schuylkill, even though a new skyline of glass skyscrapers is springing up before our eyes. Logan Square's volunteers were able to extract some concessions from PMC, particularly related to traffic circulation, but they were clearly outmatched by the developer. Once a local management company with a portfolio of older apartments, PMC has been aggressively constructing buildings, most recently One Water Street and 1900 Arch. The company has also become a force on the Schuylkill waterfront, where it is overseeing the construction of the new headquarters for Aramark at 2400 Market. It acquired the Logan Square site in 2015 from another developer, NPI. Even as the Logan Square area was exploding with new construction, the 3.5-acre site had continued to challenge developers. Part of the problem is that the low-lying parcel is entirely in the floodplain. That makes construction expensive and limits what kind of uses can be on the ground floor. NPI, however, managed to secure a zoning upgrade to allow taller buildings and, more significantly, second-floor retail. After hiring Gensler to work up a design, it flipped the site to PMC. Now the plan is effectively a fait accompli that neither the civic association, the Design Review board, nor city planners have the power to change. This plan shows how PMC’s two proposed towers would be arranged on the 3.5-acre site. Both towers are set on garages and are perpendicular to the Schuylkill. Gensler's design calls for two, 300-foot-tall, wafer-thin towers that would sit perpendicular to the river to preserve the views. They would rest on large parking podiums, one north of Arch Street, the other south. A landscaped space between the two buildings would be open to the public, but it is more driveway than plaza. Thanks to the variance allowing retail on the second floor, PMC says it has been able secure a major supermarket as a tenant. The store would be in the north garage, with a modest entrance at Arch Street and a 100-foot run of windows along 23rd Street. PMC also plans to install a small cafe in the south garage. The rest of the ground floor will be an impenetrable jumble of blank walls, garage doors, and loading docks. PMC insists this is the best it can do given the constant threat of flooding. Though it's hard to argue for underground parking given the challenges of being in the floodplain, the fortress walls aren't the only design option. PMC is receiving a lot of public benefits for this project: a zoning variance and the property-tax abatement. It has an obligation to give back to the public realm. This earlier proposal for the site, prepared by Gensler for the developer NPI, showed townhouses wrapping the garage. They appear to be elevated to avoid flooding. One way to do that would be to open up the crucial Cherry Street corner to bring life into the neighborhood. It might be a retail space for a tenant that can deal with a bit of occasional flooding; a garden store was suggested by a member of the Design Review board. But it could also be a small park or playground. If PMC isn't sure how to proceed, it should look next door at the Rivers Edge Condominiums tower. That high-rise forms a traditional edge along 23rd Street. Its main entrance faces the street. And there are two retail tenants occupying spaces with large windows. That tower was built in 1980. Even back then, some developers understood what makes urban buildings work. PMC’s proposed apartment project on 23rd Street calls for a 54-foot-high, solid garage facing the Schuylkill River Trail.